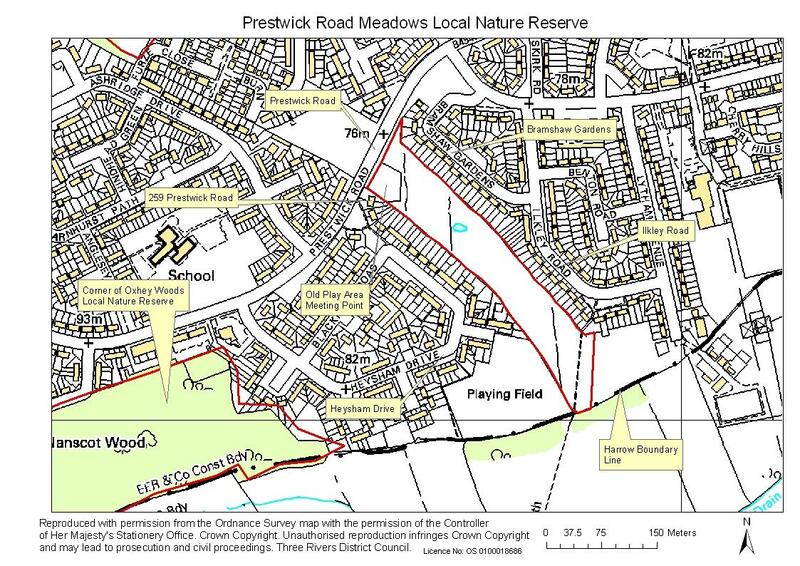 Prestwick Road Meadows Local Nature Reserve is a remnant of old farm meadows in South Oxhey. The ancient hedgerows that separated the fields can still be seen today. More than 97% of flower rich hay meadows and pastures have been lost since the 1940s and this is one of the few meadows that has survived untouched. Summer is the best time to see Prestwick Road Meadow in flower, although the seasonal pond can be a hive of activity with tadpoles, frogs, herons, butterflies and dragonflies. For more information, please download our leaflets below or vist the Green Our Herts website. Keep an eye on our Events, Community Groups and Volunteering page, to find out when our next wildlife walk or talk is happening. By road: approximately 7.1 miles (11.4km) from junction 18 on the M25 off the A404. appoximately 5.1miles (8.2km) from junction 5 on the M1 off the b462 and then A4008. Follow signs for South Oxhey. By tube: Carpenders Park Station is 0.9 miles (1.4km) away. By bus: for services from Watford, Rickmansworth, Amersham and Chesham contact Traveline on 0871 200 2233. Google: How to find Prestwick Road Meadows. Three Rivers District Council is not only responsible for the management of our parks and open spaces, we see ourselves as guardians who promote, conserve and enhance our natural heritage, for future generations. As part of our management role, we want to make sure that we are meeting the needs of our residents. Are we providing what you need from our parks and open spaces? Each year Three Rivers District Council carries out a survey of the users of our parks and open spaces but we may not get the opportunity to speak to everyone. Why not contact us to tell us what you think about our parks and open spaces on 01923 776611 or e-mail us at leisure@threerivers.gov.uk. If you have enjoyed a particularly beautiful walk, cycle or hack through our picturesque countryside, parks or open spaces, then send them to us so that we can share them with everyone. Send your images to leisure@threerivers.gov.uk.